You may have heard about the recent backlash of the Pepsi commercial starring Kendall Jenner. Here at Germono Advertising Company, it is against our company policy to publicly position ourselves on one side of the fence when it comes to politics and religion and we advise the clients we work with to do the same. We pride ourselves on having a company filled with open minds and hearts and practice this in all we do and we also have a plan when it comes to public relations. Your company should too and if you don’t, let us help you with that. With that being said, Rachael and Lindsey thought it might be a good idea to approach the Pepsi commercial disturbance from an advertising agency and marketing coaching perspective. Our clients come to us for our creative expertise and value our opinions since we all have years of media experience under our belts. Our question: what if the commercial was edited? What if the one that aired omitted the police officers and ended before the 2 minute mark? Do you think it would have been better received? Lindsey: I think if it ended at the 1:55 minute mark, a totally different message would’ve been delivered. Watch it again and imagine it without police officers and it stopping at the 1:55 minute mark. I feel that edit would have allowed Pepsi to position itself as a product that is present during times of unity. I also think blending Kendall into the crowd and not at the forefront would allow for a message of compassion to be a part of movements instead of leading them. The peace symbols the individuals are making around the 1:47 mark are so strong, the spot could’ve stopped there and yielded a much different response. Running the finished spot by a test audience for reaction is crucial. Perhaps that test audience would’ve been able to catch what the producers were missing and they would’ve had time to edit the spot to portray a message they were intending. Rachael: I too feel that the message starts to take a controversial turn when the image of the police officers comes into focus. The initial feel of the advertisement was one of unity and people coming together for a common cause. 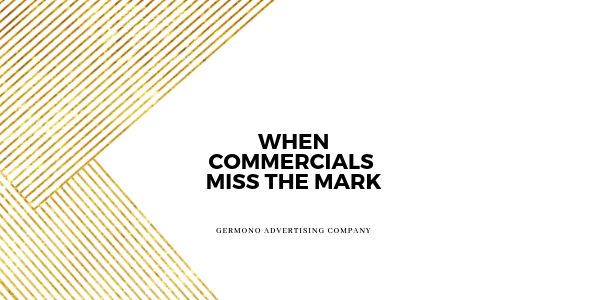 There was no specific movement specified, which is what advertisers should aim to do with each campaign. I would have had the musician, photographer, and model all come together in a way that shows them sharing a Pepsi with one another and then sharing one with the people gathering in the streets. They would have achieved a goal of a promoting a “global message of unity, peace, and understanding” instead of one that many feel downplays the recent protests. Most of us know that a drinking a soda is not going to solve all the issues in the world we are currently facing, but Pepsi is trying to show their support of people coming together in a peaceful way (I hope). They did miss the mark on this one completely and it could have been avoided with a few creative tweaks. What are your thoughts on the Pepsi advertisement? Rachael Somplasky is a Brand Associate at Germono Advertising Company. She has a decade of sales experience in traditional and digital media; as well as, the tactical industry. Her current focus and passion is on combining creative elements with current trends in social media. Contact Rachael at Rachael@Germono.com. Lindsey Germono is the founder of Germono Advertising Company and host of Drop and Give Me 20 podcast. She can be reached via email: Lindsey@Germono.com.